The 2007 Women's European Volleyball Championship was the 25th edition of the event, organised by Europe's governing volleyball body, the Confédération Européenne de Volleyball. It was hosted in Charleroi and Hasselt of Belgium and Luxembourg City of Luxembourg from 20 to 30 September 2007. The tournament was played in three different stages. In the first stage, the sixteen participants were divided in four groups (A, B, C and D) of four teams each. A single round-robin format was played within each group to determine the teams' group position; the three best teams of each group (total of 12 teams) progressed to the second stage. The second stage of the tournament consisted of two groups of six teams each. As the first stage match results amongst the teams which advanced to this stage also counted, the two groups had been predetermined, one group formed by groups A and C teams while the other was formed by groups B and D teams. In each of the two groups, the teams played once against every opponent they had not faced in the tournament (total of three matches each), adding that to the results obtained against the other two teams who also advanced from the first stage same group. The two group winners and two runners-up from this second stage advanced to the third stage. The third and final stage of the tournament was composed of the semifinals, third place match and final. Each of the semifinals was played between the winner and the runner-up of the same second stage group. The tournament was played at three venues in three cities, of which two were in Belgium and one in Luxembourg. 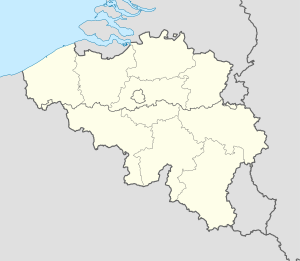 Group stages where held in Belgium and Luxembourg hosted the Final round. All times are Central European Summer Time (UTC+02:00). Simona Gioli, Paola Croce, Valentina Fiorin, Martina Guiggi, Jenny Barazza, Manuela Secolo, Taismary Agüero, Francesca Ferretti, Eleonora Lo Bianco, Antonella Del Core and Paola Cardullo. ^ "2006/2007 European Championships Women". CEV. Retrieved 14 April 2017. The 2005 Women's European Volleyball Championship was the 24th edition of the event, organised by Europe's governing volleyball body, the Confédération Européenne de Volleyball. It was hosted in Pula and Zagreb, Croatia from 17 to 25 September 2005. The 2011 Women's European Volleyball Championship was the 27th edition of the European Volleyball Championship, organised by Europe's governing volleyball body, the Confédération Européenne de Volleyball. It was hosted in Italy and Serbia from 23 September to 2 October 2011.